I hope that everyone has had/is having a wonderful holiday season! I’m still recovering from all of the festivities (and the preparation for the festivities) but I’ve been eager to get back to my beloved drawing board. My “New Year’s Resolution” this year is to post more new art to this blog, so starting this week there will be at least one brand-new piece of artwork every week. More ambitious plans are in the work, but logistics still need to be worked out. This week’s post doesn’t count, by the way, although it is a little something new to celebrate the new year with. I’ve re-worked my Chinese Zodiac series into a handy calendar, available for sale on both my RedBubble gallery and my Zazzle store. 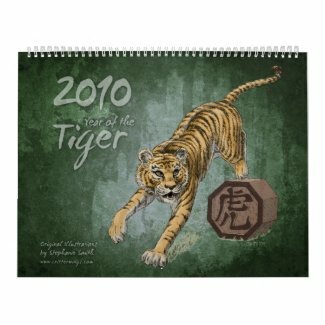 2010 is the Year of the Tiger so that big cat graces the cover of the calendar. The Zazzle calendars have more options, but the RedBubble calendars are gorgeous (and you get free shipping if you order 3 or more, from me or from any of the other fine artists there) so if you’re still looking for something to fill that bare spot on your wall now is your chance. I’m adding new products to my Zazzle store and my CafePress store featuring the original versions of the artwork as well as these recolored versions, including special limited-edition gifts for Chinese New Year (February 15 this year) so check back regularly… and if there’s something in particular you’re looking for, ask! I’ll be back later this week with some more art to share… Happy New Year! This entry was posted in animal, Astrology, Critterwings, Finished drawings by stephanie. Bookmark the permalink.